Appreciating his upcoming venture of Total Siyappa and his vocal prowess both the stars had a good laugh discussing his very first hit “Sun Reh Sajanaiya”. Shah Rukh also insisted on claiming that Ali Zafar had sang a song named “har su” whereas,laughing, he kept on denying it. 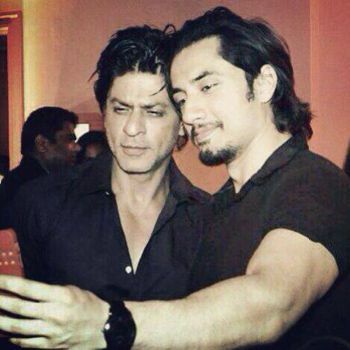 Jamming the night with King the duo shared a good laugh as Ali tweeted that he was King Khan for a reason.Pakistani singer-actor Ali Zafar, who is gearing up for the release of his next Bollywood venture Total Siyappa has been promoting his new movie on all fronts . Ali Zafar has already established himself well enough inIndia to create anticipation as audiences look forward to the release of Total Siyappa. Donatella Versace: It’s Moisturizer – Not Plastic Surgery!